ure most of us know generally what happens in soccer — or “football” as they call it in other countries. But, when you really think about it, do you know all the rules, positions, and nuances of the game? Here’s your chance to get up to speed, especially considering the timing. Soccer is played between two teams on opposing sides of a field. The object of the game is to kick a soccer ball into the opposing team’s goal without using either hands or arms while in play. In other words, players can touch the ball using their other extremities and pick it up when it’s out of play like when a ball is kicked out of bounds. General gameplay involves one team in possession of the ball. The process of kicking it down the field is called “dribbling.” Players can also pass it amongst themselves to try and get to where they can better score a goal. All the while, the opposing team constantly tries to take the ball away. Ball possession will change very frequently in this game. The field could either be made of grass or artificial grass but must always be green. Each team has up to 11 active players on the field. These consist of 1 goalkeeper and 10 regular players. However, a match may not start if either team has fewer than 7 players. Player positions are broken up into offensive and defensive positions. 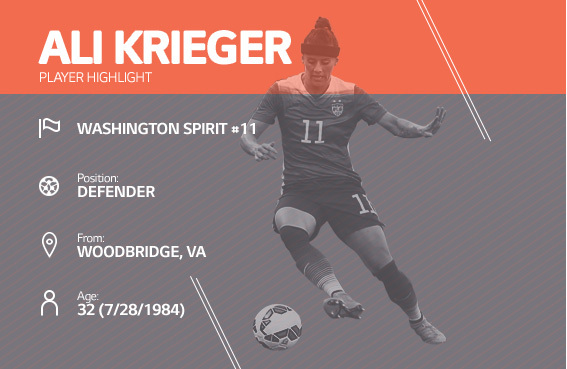 Ali Krieger takes her position as a role model very seriously, always making time to mentor young girls and help foster their love for the game. Her biggest piece of advice to soccer’s future stars is the same advice her father gave her growing up: Never Stop Playing. See Ali play with the LG G5 and all of the LG Friends. The only player allowed to use their hands. They’re restricted to playing in the rectangular penalty area near the goal. Their job is to stop the other team from scoring. These players try and keep the ball away from the goalkeeper by preventing the opposing team from passing and receiving. They can also block shots attempting to score. Typically, teams play with four defenders. They link the offense and defense, either helping to get the ball to forwards or preventing the ball from having to reach the defenders. These players are expected to run the most in the game since they do double the duty. 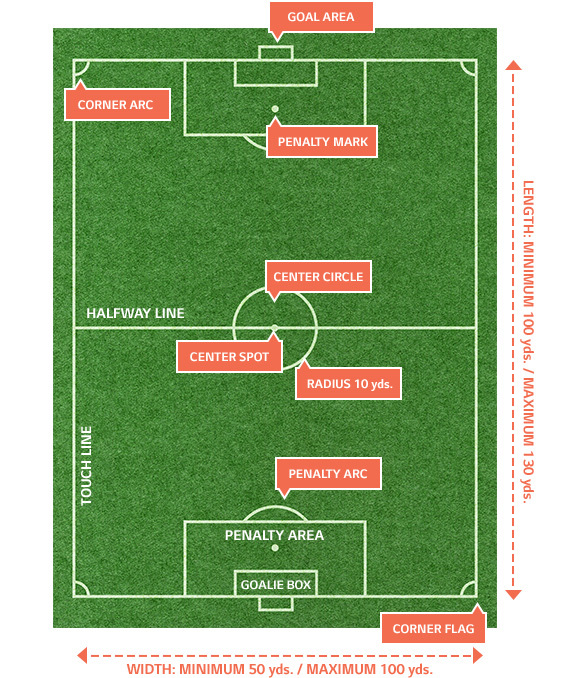 Different types of midfielders include: holding midfielders, box-to-box midfielders, playmakers, and wingers. Some lean more defensive or offensive depending on where they’re placed on the field. They score goals. Period. These players are often the celebrities you see on TV since they can be the most celebrated. A center forward is also known as a striker, and often, they’re seen as the most dangerous player on the field. These can get complex, but here is just a brief rundown of some general terms you should know. Used by a referee to indicate a player has been cautioned for minor offenses, which could include unsportsmanlike behavior, arguing with the referee, excessive fouling, delaying the game, or entering/leaving the game without permission. Used by a referee to kick a player out of the game. These are used for serious fouls, violent actions, cursing, and receiving a second yellow card. After a foul, the ball is placed at the point of where the foul took place. It’s placed stationary on the ground and kicked to restart the game. A goal could be scored directly from these types of kicks. This is like a direct free kick, except a goal cannot be scored directly from this kick. It must first make contact with another player. These types of kicks are awarded when a foul is punishable by a direct free kick and is committed within the offending player’s own penalty area. Whenever there’s a tournament and a winner needs to be decided (i.e. no draws allowed), the game goes into a penalty shootout. The two teams select five players to take turns attempting a series of five penalty kicks. Whichever team scores most out of these kicks is crowned the winner. If the shots are tied, the shootout goes into another round until a winner is determined. Now that you’ve cracked the surface, we hope you’ve gotten a better understanding of this incredibly popular game. Have any more questions? Or was there anything we missed? Drop us a line in the comments below.